Dr Nicholas Behn, a Speech and Language Therapist from the Division of Language and Communication Science in the School of Health Sciences, was chosen for a recent international event in Brazil to discuss the neuropsychological rehabilitation of people with Acquired Brain Injury (ABI). 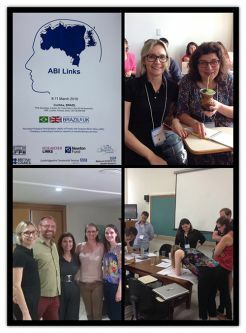 Held on the 8-11th March at the Universidade Federal do Paraná in Brazil, the Newton ABI Links workshop brought together early career researchers interested in helping survivors of brain injury achieve an improved quality of life and improve neuropsychological rehabilitation services through the creation of a multicultural research network of interdisciplinary services. The workshop was co-funded by the Newton Fund, which is a £375 million fund (£75 million a year for five years) that promotes the economic development and welfare of poor people in partnering countries through science and innovation partnerships. It aims to strengthen science and innovation capacity and unlock further funding to support poverty alleviation. The fund is overseen by the Department for Businesses Innovation and Skills (BIS) and delivered through 15 UK delivery partners in collaboration with 15 partnering countries. Activities of the Newton Fund are in three broad areas, including increasing capacity for science and innovation in partner countries; research collaborations on development topics and creating collaborative solutions to development challenges; and strengthening innovation systems. As the only Speech and Language Therapist chosen to participate from the UK, Dr Behn highlighted the importance of identifying and treating communication problems within an interdisciplinary team for people with ABI. “The workshop was a unique, inspirational and exhilarating experience to be part of. The process facilitated and encouraged active listening of others, respect for a wide variety of opinions, understanding of the different healthcare systems and challenges to research implementation, appreciation of different cultures with different values, and the importance of collaboration in the development of a good research strategy. New international research links were forged between disciplines across the two countries resulting in partnerships that are more likely to be stronger and long-lasting extending into the future. The workshop was jointly co-ordinated by Dr Andrew Bateman (Oliver Zangwill Centre for Neuropsychological Rehabilitation) and Professor Ana Paula Almeida de Pereira (Universidade Federal do Paraná) and brought together around 40 early career researchers from both the UK and Brazil. There was a diverse range of professions including Psychologists, Neuropsychologists, Physiotherapists, Occupational Therapists, Speech and Language Therapists, Clinical Scientists, Psychometricians and experts in areas such as Neuroengineering and imaging.